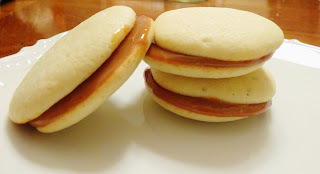 Alfajores are a traditional sandwich cookie made with dulce de leche that my husband enjoyed while he was living in Argentina. And, like these Snickerdoodles, they're a cookie that he's been asking me to make since we got married... So without delay, here's the recipe! Rather than a traditional shortbread cookie that you roll and cut out, this recipe makes a soft drop cookie that tastes just like a sugar cookie. Preheat oven to 350 degrees. Line two baking sheets with parchment paper. In a medium bowl, sift together the flour, baking powder, and salt. Set aside. Cream together the butter and sugar until light and fluffy - about 2 minutes. Beat in eggs, one at a time, and continue mixing until well combined. Working in batches, add flour mixture. Add in the milk, orange juice, and vanilla; continue mixing until it is all well blended. The result is almost the consistency of a batter. Use a small cookie/ice cream scoop (1 Tbsp) to drop dough onto prepared baking sheets, about 2 inches apart. Bake 10-14 minutes, until cookies just start to turn golden. Transfer to a wire rack until completely cool. When cookies have cooled completely, spread the bottom half of the cookies with dulce de leche. Sandwich together with remaining cookies. Store in an airtight container for up to 2 days. Makes about 31 Alfajores. Remove the label on the can of sweetened condensed milk, give it a good rinse and pierce the top of the can twice. Place a small towel or washcloth in the bottom of a medium saucepan. This will keep the can from rattling for 4 hours. Fill pot with water just up to about 1/2 an inch below the top of the can. Turn heat to medium-high and bring to a boil. Reduce heat and keep water at a simmer. Allow to simmer 3-5 hours, being sure to keep water level 1/2 - 1 inch below the top of the can (you will have to add water periodically.) Be careful to keep water out of the can: if you see it pooling on the top, use a spoon to carefully scrape it off. When finished, use tongs to carefully remove can from pot. Open and scrape the contents into a large mixing bowl. Be careful - it's hot! The top will be runny, but the stuff at the bottom will be very thick and custard-like. Whisk together until smooth. 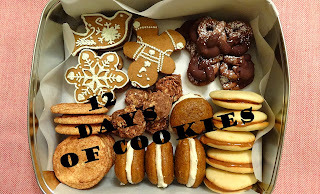 Allow to cool completely, transfer to an airtight container and store in the fridge for up to 1 month.